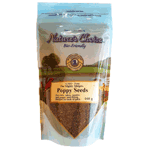 Poppy seed adds colour, flavour and texture to bakery goods when used for decorating purposes. For bread rolls, candy and cakes. Import of South Africa.